1 of 6 Heat oven to 400 degrees F. Coat large rimmed baking sheet with nonstick cooking spray. Place carrots, zucchini and red pepper on sheet. Coat veggies with cooking spray and season with 1/4 teaspoon salt and 1/8 teaspoon pepper. 2 of 6 Bake in 400 degree F oven for 45 minutes, or until vegetables are browned and tender. 3 of 6 Meanwhile, bring a large pot of water to boiling. Lightly salt water; add the beans and broccoli. Simmer for 7 minutes. With a slotted spoon, remove vegetables from water to medium bowl, leaving pot on heat. 4 of 6 Add penne to boiling water; cook following package directions. Drain. 5 of 6 Meanwhile, heat large nonstick skillet over medium-high heat. Add bacon and garlic; cook for 5 minutes, stirring to prevent garlic from burning. Add broth, tomato, red pepper flakes, Italian seasoning and remaining salt and pepper. Bring to a simmer. 6 of 6 Add beans and broccoli to skillet; cook for 1 minute to heat through. 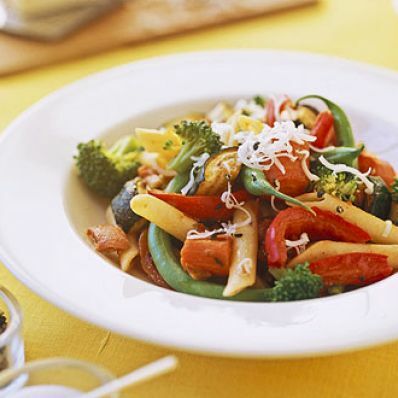 In large bowl, toss together pasta, contents of skillet, roasted vegetables and basil. Serve with cheese. Makes 4 servings. Per Serving: 15 mg chol., 8 g Fat, total, 3 g sat. fat, 8 g fiber, 692 mg sodium, 16 g pro., 343 kcal cal., 56 g carb.